AND THE WINNER IS....Cover Reveal: THE DARING PRINCE DASHING (and Giveaway)! Thanks again to everyone who entered Marilou's Cover Reveal Contest. We have a winner! Congratulations, Danielle! Send me an email [address in profile], and I'll forward your information to Marilou. Thanks for playing, everyone. And congrats on the book, Marilou! I'm thrilled to host my good friend and critique buddy, Marilou Reeder, on Just Kidding. Marilou is a fellow picture book author and an incredibly nice person. That's why I'm honored she chose my blog to reveal the cover of her debut picture book, THE DARING PRINCE DASHING! (Woot!) Don't you just love the illustrations by Karl West! You'll love Prince Dashing's story, too! Read on for more daring details. Hi, everyone! 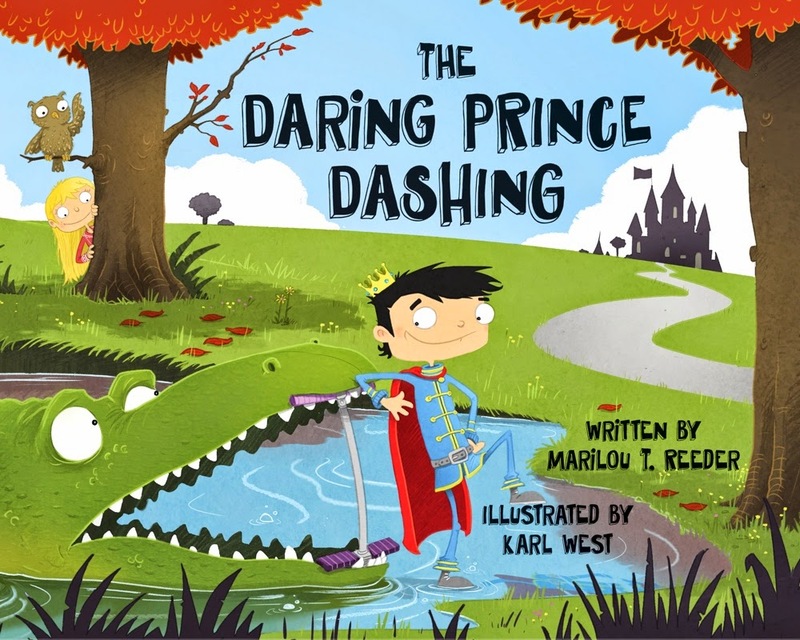 I’m so excited to share the cover of my first picture book, The Daring Prince Dashing, with you. The illustrator is the über talented and hard-working Karl West. He has added so many fun details in the spreads, and it’s been a real thrill to see my characters come to life through his artwork. This is a debut book for both of us. The Daring Prince Dashing is about an adventurous prince who finds his kingdom pretty boring until he meets his fearless match. It releases on November 3, 2015. To celebrate my cover reveal, Jody is hosting a giveaway on her blog beginning today! Just share my cover somewhere on social media (twitter, facebook, etc.) and then leave a comment on Jody’s blog telling me what you’ve done. You’ll be entered into a drawing for a $15 gift card to Barnes and Noble. The deadline for entering is Monday, May 4th, and the winner will be announced on Jody’s blog the next day. I'm delighted to be part of your cover reveal, Marilou! 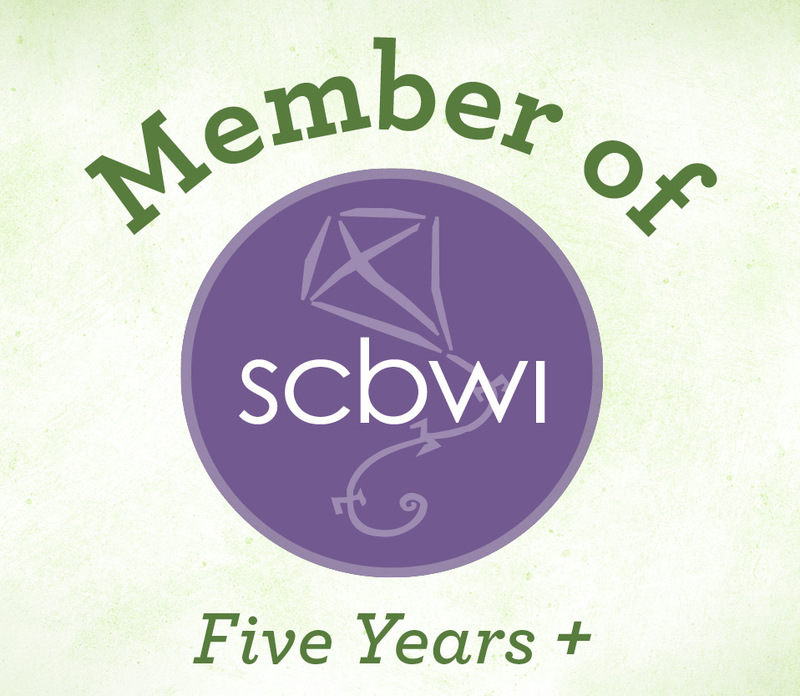 Congratulations on your first picture book! Friends, don't delay! Share Marilou's cover, and then dash back here and tell us where you've shared! You can find Marilou on twitter @MarilouReeder. 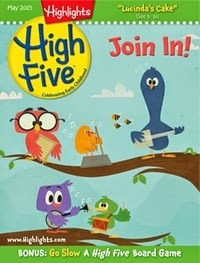 It's the Day-After-Earth-Day, and I'm celebrating with a little golden bird...and the May issue of High Five magazine. Why? I have a letter poem, "Lucinda's Cake," on pages 16-17 about a bird. I hope you'll check it out at your local library. Or...listen to the issue at HighlightsParents.com. Click on the blue High Five image then on the "High Five Audio Edition" button on the right. Enjoy, and Happy Earth Day! THE WAY THE COOKIE CRUMBLED! Some delicious news has been baking at my house! This went up on Publisher's Marketplace today.